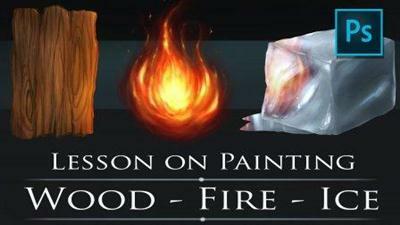 In this class you will learn how to paint a wood texture, a fire ball, and a block of ice. We will cover the basic techniques in Photoshop CC to create these effects. You will learn about custom brushes, selection tools, blending modes and much more. By the end of this class you will have completed these three materials and have a much better understanding of how to create your own conceptual elements in this powerful program. I am using a Wacom tablet to draw and paint with. You can use anything that you are comfortable with to create the artwork but somethings will work better with pressure sensitivity from a drawing tablet.